It really wasn’t our week. Two races were held today in very nice conditions and we finished third in both. Bella Mente won both races to win the class. The breeze was in from the south-southeast at about 18-20 knots. There was a fair amount of chop and the downwind legs were fast. We “shrimped” the spinnaker at the first bottom mark and were over early at the start of the second race. That was not the way we had wanted to leave the week. Competition is very cut and dry. There are winners and losers. You have to take your lumps when it is not your week. It makes you appreciate the good ones! So now we have to look forward. That is the good thing about competing. There is always the next race! The Shockwave guys couldn’t be a nicer group and I really enjoyed my time with all of them. I am off the Miami for the US Olympic Sailing Team Annual dinner tomorrow night. AmericaOne is a large supporter of the USOST and I will be representing A1 there. The short story is we did not have a good day. We finished 3rd in both races today. In the first race, we lost by 15 seconds and in the second race by just one second! Nothing remarkable happened in the races. Just a steady progression. The fact that Bella Mente and Shockwave are fairly close in rating is helping Numbers. For example, in the second race today, we on Shockwave were just on the heels of Bella Mente up the second windward leg. Being the higher rating and faster boat, Bella was worried about not getting their 40 seconds of time on us. So they began tacking on us at every opportunity. This cost the both of us easily 15 seconds relative to Numbers who was just sailing along undisturbed, 3 minutes behind. Then we lost second place to Numbers by 1 second. I am frustrated at our performance here this week and I take the responsibility personally. We don’t have a chance to win this regatta at this point. So all we can do is go out and have the best day we can tomorrow and try to leave the event on an up note. Numbers and Bella Mente are tied on 15 points. They will have a good battle, albeit they won’t see each other most of the day. We have 19 points. The forecast is for 15-17 knots so it should be some fast sailing on these 72 footers. The owner of Shockwave, George Sakellaris, is a great guy. Self made man, immigrant from Greece, university education in the USA, engineer, very perceptive, a man who obviously loves sailing. I have enjoyed meeting him and hanging out with him this week. For complete results go to: http://www.yachtscoring.com. Bella Mente’s request for redress hearing was reopened this morning. Shockwave and Numbers were present this time. Reason prevailed and redress was denied. So Bella Mente scored a 4, 3 yesterday and all three competitors are within one point going into todays racing. With a forecast that was too light to race, the wind gave us a pleasant surpass, and we managed to get in two races today. The wind came in at 6-8 knots from the north-northwest around 11:00 and the race committee was quick to jump on it. In the first race, we had a relatively minor collision with Bella Mente at the start but it was our (my) fault and we had to do a 360 penalty turn. That cost us about 45 seconds. Shortly there after, Bella Mente ran into a wreck that is on the course and marked with a government buoy. They just went too close to the buoy. A bit surprising, really. With all of that going on, Numbers won the first race rather easily. In the second race, which started in just 6 knots of wind. We on Shockwave, had a very good start to windward of the group and were able to control the fleet out to the left and lead at the first mark. From that point, it was about managing our lead and trying not to mix it up with Bella Mente and yet stretch out on the smaller Numbers. We owed numbers 2:49 in that race and only beat them by 2 minutes. So numbers had 2 wins today, we on Shockwave two seconds and Bella Mente a 4th for not finishing the first race and then a 3rd in the second race of the day. So now, the three of us are all within one point as we head into the last four races. As we are today, we would loose a tie breaker to either of the other two so we need to be a point clear ahead to win. We have been working all week on our performance and we feel that we are getting better each day. I must say that I haven’t done a very good job so far so I am determined to right that tomorrow and Friday. We will need to be clicking on all cylinders to win this class! 19:00 UPDATE: I just went to yachtscoring.com myself and saw that Bella Mente asked for redress for both races today, based on their running into the wreck. Hard to imagine. Whats more, the jury award them redress for each race. They gave them a 1.25 score for each race rather than the 4, 3 that they scored. What could be the basis for that decision? I could not find any “facts found” issued on the official jury notice board. So get this; you are sailing along, no other boat within 200 meters of you, you run into something and tell the Jury it was someone else’s fault? The wreck is marked by a government buoy! It is marked on the navigational charts! Further, the race committee has warned the fleet about it each day before racing. Never heard of anything like that. I don’t know what is more unbelievable; the asking or the getting. I am now told the Jury is reopening the hearing in the morning. “Shockwave in Traffic”, credit Tim Wilkes. Two races were held today in fairly steady conditions of 7-12 knots from the south. A first race raw started and abandoned about 3/4’ers of the way through due to lack of wind. In both races, Bella Mente had just slightly the better of us. Nothing dramatic happened in the races and were managed our position to not get tacked on by the slightly faster boat. We finished second by 10 seconds and 7 seconds respectively. While this is frustrating, we did make a significant improvement in our performance of our boat from yesterday. We have been working hard on our rig tune and mainsail set up. After 4 races, Bella Mente leads with 5 points, we on Shockwave have 9 and Numbers has 10. 6 more races are scheduled. Tomorrows forecast is not good. Very light wind. 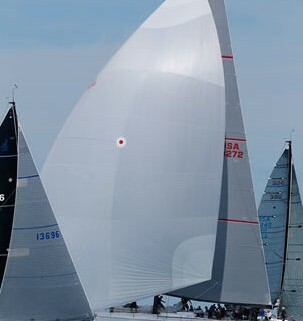 For complete results, go to: wwwyachtscoring.com and click on Key West Race Week. Could not find any pictures of the racing on the site yet so I took this picture which I found pretty interesting. 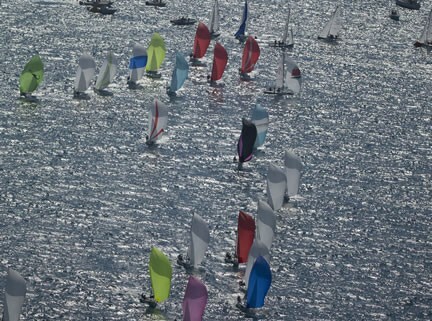 Day one of Quantum Key West Race week was very typical, sunshine and 8-12 knots of wind from the northeast. I am onboard George Sakellaris’ 68′ Shockwave this week and we are racing in the Mini Maxi division with two other competitors: Bella Mente and Numbers. Bella Mente won this class last year and is off to a good start this year gettung a second and a first today. She seems very fast. Numbers won the first race. We on Shockwave had a bad first race and a little better second race finishing second. The wind was very shifty and even fickle as it came straight over the island into our race course. Two races are scheduled each day through Friday. Tomorrow’s forecast is for lighter winds at 7-10 knots from the Southeast. Although I could not find them at the time of this writing, complete results should be at www.premiere-racing.com.